Transparent, balanced, and timely reporting of clinical trial results in peer-reviewed journals fulfills an ethical obligation to trial participants and provides critical context to help physicians and their patients make informed treatment decisions. Transparent reporting also enables accurate and objective data interpretation and validation and advances scientific understanding. Transparency is essential to establish the credibility of the research outcomes and the study sponsor. Conversely, reports of selective, biased, or unbalanced disclosure of research results or inaccurate or incomplete reporting of contributions or potential conflicts of interest undermine the credibility of the research outcomes and the reputation of the industry. 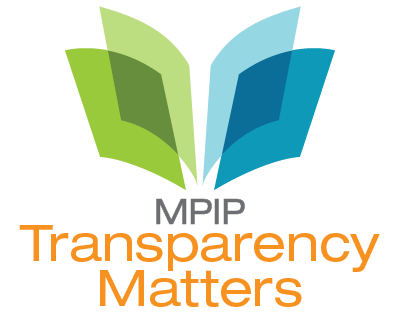 Transparency Matters is designed to raise awareness, provide resources, and help consolidate the efforts of all the interested parties seeking to improve quality and transparency in reporting the results of industry-sponsored research. Consistent with our mission, Medical Publishing Insights & Practices (MPIP) has collaborated with industry experts, journal editors, and other interested parties to identify the challenges and opportunities to increasing credibility and transparency in reporting the results of industry-sponsored research. Our research initially led to Ten Recommendations for Closing the Credibility Gap in Reporting Industry-Sponsored Clinical Research. This publication established the roadmap for subsequent MPIP outputs (see Best Practices). Many pharmaceutical companies have integrated the MPIP tools into their publication processes. MPIP has been joined by various societies in our efforts to raise awareness and develop best practices to improve standards. Best-practice recommendations also have been developed by groups such as the International Committee of Medical Journal Editors (ICMJE) and ISMPP, who published Good Publication Practice for Communicating Company-Sponsored Medical Research (GPP3) in 2015. In recent years, several efforts have been made to improve disclosure by industry, authors, and journals. Despite these efforts, questions remain, including how industry influence or author conflicts of interest could potentially bias the presentation of results in clinical trial publications and how these relationships are perceived by physicians, patients, and the general public. In a recent MPIP survey of medical journal editors, the majority perceived an improvement in transparency and credibility of industry-sponsored clinical trial publications (2010-2015), but the editors also highlighted areas for continued commitment to embedding best practices (Mooney LA, et al. ISMPP 2016 [poster]). Companies across the pharmaceutical industry continue to work with authors and journals to improve the transparency of industry-sponsored clinical research and enhance credibility. The goal of Transparency Matters is to broaden the conversation around transparency in medical publications, promote best practices, and engage interested parties in this important mission. Marušić A, Hren D, Mansi B et al. Five-step authorship framework to improve transparency in disclosing contributors to industry-sponsored clinical trial publications. BMC Med. 2014;12:197.
International Committee of Medical Journal Editors (ICMJE). Recommendations for the conduct, reporting, editing, and publication of scholarly work in medical journals. (ICMJE recommendations, formerly the Uniform Requirements for manuscripts). Updated December 2015. Available at: http://www.icmje.org. Accessed April 11, 2016. Battisti WP, Wager E, Baltzer L, et al. Good Publication Practice for Communicating Company-Sponsored Medical Research: GPP3. Ann Intern Med. 2015;163(6):461-464. Mooney LA, et al. Transparency and credibility of industry-sponsored clinical trial publications: a survey of journal editors [poster]. Presented at: 12th Annual Meeting of ISMPP; 2016.